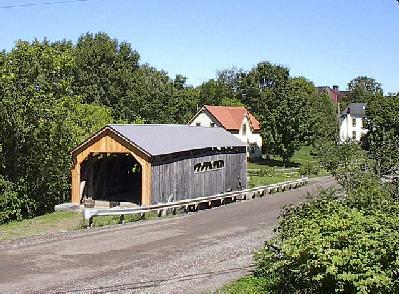 Westford covered bridge is one of about l00 left in Vermont. It is one of two that were located in the town center. 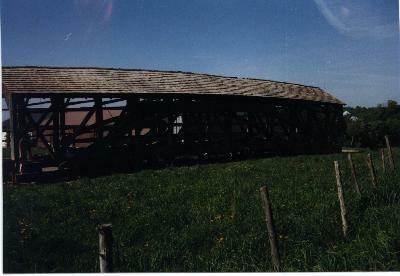 The “sister” bridge burned during a fire that started in a nearby creamery around 1910. An iron bridge was then built, that was taken out in the “Flood of 1927”. Our bridge survived the great flood! The bridge is a multiple kingpost truss with Burr arch, built 1837/8, it’s 20′ x 97′ and weighs 40 tons. The Browns River bridge is the second oldest in the state of this arch type. On November 22, 1836, Westford voters resolved to build “…..a single arch bridge where the old one stands near Halbert’s Store (now the Westford Market), calculated to be fourteen feet wide and built on the old abutments”. This new bridge was originally to be constructed by July I, 1837, at the cost not exceeding $600. The covered bridge was used until 1965 when a steel and concrete bridge was built along side it. By l975, the then 137 year old bridge had been greatly neglected. The first Westford Historical Society was formed in July of ’75 and along with help and supervision of the US Navy Seabees from the Reserve Mobil Construction Battalion 09-27 in Burlington to get the necessary repair work was done. By 1987 the bridge was once again in need of major restoration work The Westford Historical Society was regrouped that year. The Society contracted with Milton Graton to do the restoration work. In October of that year, the bridge was moved up the hill to the Town Garage property, awaiting its restoration work. Work also needed to be done on the broken wing wall of the east abutment. Years of applying for grants and holding fund-raisers went by. In 1991, federal grant money became available (Intermodal Surface Transportation Efficiency Act of 1991 “ISTEA”). Kathlyn Robie wrote the grant, which was received in 1995, and obtained the needed permits. The restoration and return of the bridge became a truly successful community effort, led by the Westford Historical Society in cooperation with the Town of Westford. The bridge work has now been completed and the bridge returned to its original site on the Cambridge Road.